The Alabama men's basketball team is on high alert. Currently mired in a three-game losing streak, this young team must find a way to get back on track in their final home game of the season Tuesday night vs the Florida Gators. Alabama enters the game with an 8-8 league record, while the Gators, fresh off an impressive win at home over Auburn, enter with a 9-7 record. Game time is 6 P.M. CT. ESPN is handling television duties. Click the link for team and KenPom stats. My Two Cents: Things can turn quickly in college basketball. Two weeks ago we all lamented over the inconsistency of this team, but felt confident they would end the program's six year tournament drought. Now in the wake of this three-game losing streak, that confidence has been eroded. This Alabama team now finds itself in a must-win situation on Tuesday night. Their resume is strong, and continues to prop them up as of today, but it's not an air-tight resume. If the bracket was selected today, I do think that Alabama would be in the field, but I also think that as of today they're probably one of the last 8-10 teams in the field. They must find a way to get back on track this week, and maybe next week in St. Louis, to avoid what would be one of the most disappointing finishes in the program's recent history. As an Alabama basketball fan, I've tried to temper my expectations in recent years as the program has fallen on hard times. However, it was hard not to be excited entering this season. A top 10 recruiting class, a good class of returning players, and a head coach who was not shy about saying in public that the staff had been working towards year three. I didn't expect this team to win a conference title or make a deep tournament run (there's just too many variables in a college basketball season to put faith in those types of expectations), but I did expect a more consistent effort than what we've seen this season. Yes, the team is young (the fourth youngest team in D1 basketball to be exact). Yes, this team is playing in a much-improved SEC conference. Yes, they played a very difficult non-conference schedule. All the more reason to be frustrated by the lapses in effort, chemistry and leadership this season against such a difficult schedule. All the more reason to be frustrated by the appearance that Avery Johnson continues to struggle with the transition to the college game. I think this struggle has been reflected in the head-scratching player combos he has put on the floor this season, and not leaning heavily enough on his star players to play major minutes. In the NBA you have a roster full of pros which gives you more options on your bench, but that's not the case in college. In the pro game you have an 82-game schedule, which allows you more freedom to rest players for long stretches, while developing guys on your bench. In the college game, you have a small window of time to identify your best players and assemble rotations that lean heavily on their talents to give the team the best chance to win. The best player on this team averages under 30 minutes per game. In fact, no player on this roster averages 30 minutes or more per game, but all ten available scholarship players currently average double figure minutes. That seems counter productive to me. But what do I know, really? I'm just a working stiff who writes for an obscure blog in my spare time. Avery Johnson is the coach as well as a former player. He knows more about the game than I do, I'm sure. That being the case, it's on him to figure things out and to deal with the criticism that follows when he doesn't. Some fans are calling for a change on the bench, which I am not ready to support. It's fair to criticize Avery for some of the shortcomings we've discussed here this season, but this is also a man that has embraced the opportunity at the university, has worked tirelessly to promote the program, connect with the community, and has recruited at a high level up to this point. While I do think Avery could be a facing a hot seat situation in year four if the inconsistency continues, I'm not of the opinion that it's in the best interest of the program to fire yet another head coach and start over again for the third time in a decade. I also don't share the opinion of some who read this blog or comment on social media that fans should abandon this team on Tuesday night. I've never been a fan of abandoning support for a team simply because the coach isn't meeting expectations. I'm definitely not a fan of doing it for the final home game of the season when the team desperately needs a win to keep its NCAA Tournament hopes alive. Regardless of what some think of the coaching staff or even the players, Alabama fans should first and foremost be supportive of what is best for the program. Returning to the NCAA Tournament, regardless if they're a 1 seed or last four in, would be a positive achievement for the program after only two tournament appearances in the last twelve seasons. I don't expect fans to flock to Coleman Tuesday night (frustration with the season or the early game time will likely be the popular reasons for low attendance), but if you're not going or can't go, and you have a ticket, I implore you to offer your ticket to someone who does want to go. Players to Watch: I'm going to focus on three players instead of one for Alabama. The three are Donta Hall, Daniel Giddens and Galin Smith. Let's start with Donta, whose disappearance in the last two games has been a major part of Alabama's struggles. I think the argument could be made that Donta has developed into the second most important player on this team this season. And when he's at his best scoring, rebounding and blocking shots he has shown NBA potential. In the last three games though, he has not been a physical presence in the paint. In fact, you can say that for the Bama interior players as a unit. In the last three games the combo of Donta, Daniel and Galin have combined for 29 points (27 of those have been scored by Donta, and 16 of those were in the first game of this slide vs Kentucky), and 22 rebounds (19 of those were grabbed by Donta). Alabama has been outrebounded in its last three games, but it's not just grabbing more rebounds that's the issue as much as it is that Alabama, on the defensive end, has been extremely soft in the paint in the last three games. This has led to Bama's last three opponents scoring in the paint (40% of the opponents points were in the paint in the last three games) and giving up double figure offensive rebounds (opponents are averaging 15.6 offensive boards per game in the three game losing streak). Simply put, opponents have been out-working Alabama in the paint. To be fair, there's no guarantee that a better physical effort in the paint in the last three games ensures that Alabama wins any of those games, but I'd be willing to bet that we're sitting here today with a better feeling about this team if they had. While Donta is not free of criticism, he is the only one of the three big men that has at least produced something on the floor. Daniel and Galin have produced a whopping average of 0.6 points per game and 1 rebound per game in the last three losses. In Galin's defense, he did not play in the Arkansas game. Why he didn't is unknown to me. Avery hasn't been shy about giving him minutes, and if he wasn't getting the desired effort he wanted from Donta and Daniel, why not see what Galin gives you? Perhaps Galin did not practice well leading up to the game? The media guys did not ask Avery about Galin's absence to my knowledge so we're only left to speculate. For Daniel, he simply can't stay on the floor long enough to have any positive impact. According to the box score he only committed one personal foul, but still only played 12 minutes. In the minutes he did play, he had more turnovers (2) than field goal attempts (0), and never looked comfortable when he was on the floor. I'm okay with Donta getting the majority of the minutes among the big guys, but if he's going to play 29-30 minutes, he's got to be more of a factor on the floor from a physical standpoint. I'm not even going to preview a player for Florida. 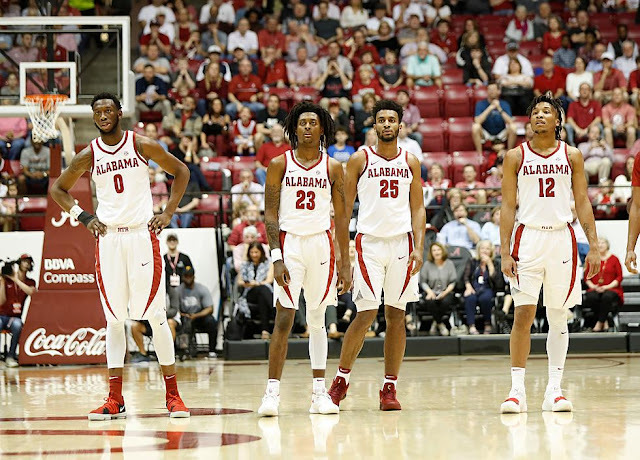 Tuesday night is all about this Alabama team having a sense of urgency and challenging themselves to come out, regardless of the crowd or the opponent on the floor. Show us something, guys.